Kalle Marina I. Moskovkin Leonid V. Rykova Elena B. The purpose of this article is to analyze the specifics of Russian personalities as units of teaching Russian as a foreign language. In the research the method of continuous sampling of personalities from the teaching materials of Russian as a foreign language (levels “beginner” and “elementary”) and the system analysis, considering the personalities as components of learning content and as an independent system (called “personosphere”) were used. The result of the study was the systematization of personalities as units of teaching and the creation of a typology of personalities. The authors propose to divide personosphere into three groups: Universal, Profile and Local-thematic Personalities. Universal Personalities are intended to be studied by all foreign students, Profile Personalities are to be studied in addition to Universal ones in accordance with the professional interests of students. Universal and Profile Personalities include thematic subgroups, and each of them is divided into two parts – obligatory and optional. Local-thematic Personalities are studied in addition to Universal and Profile Personalities depending on students study location. Such a systematization of personalities as units of teaching is necessary for their further methodological study. 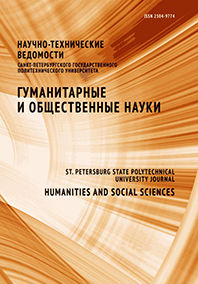 The result of this research can be used by teachers and methodologists, authors of manuals and course books of Russian language for foreigners.